Lest you think my Blog is full of negativity, I thought I would share with you a wonderful way of recognising great customer service when you encounter it. I regularly set off from Bakewell to various events and meetings around the country and my first port of call is usually Costa Coffee at Tibshelf services on the M1 (near Jct 29). Normally the service is agonisingly slow, but I put up with it simply because I love their latte! Then, on one occasion I arrived on a particularly busy day and noticed how a new lady behind the counter was managing to serve everyone extremely quickly and efficiently while still staying friendly and polite. Her name was Annette and because I was so impressed by her service, I nominated her for a WOW Award - it's a simple and free (for both nominee and recipient) way of recognising great customer service. 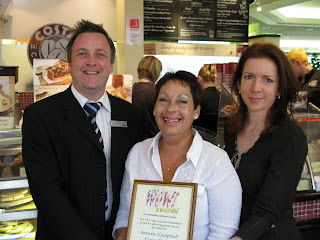 Here I am with Annette and her regional manager, presenting the Award... She was chuffed to bits and even invited her friends and family along to see her receive her certificate! We all love to complain about bad service in this country, so it's nice to have a mechanism to reward people when you notice them doing great things. I can imagine how it made the employee feel when someone took time out of their own busy life to show their appreciation. So many people rush around, making time a precious commodity, making it a very generous gesture. The WOW awards themselves are a great business idea too.